Integrating TINYpulse Engage with your company's existing Azure Active Directory will simplify user management through automation. No longer will you have to manually add users one by one, or send an import file to the TINYpulse Customer Success Team. Complete the Active Directory integration one time and users will sync automatically into TINYpulse. An Azure Active Directory instance at your company. Admin rights to your AD instance. If you're missing any one of these three things, please contact your in house technical team for assistance. Whether you're new to TINYpulse or you've been pulsing for years, the Azure Active Directory integration will significantly decrease your time spent housekeeping employees in TINYpulse. 1. Login to TINYpulse and click to Users and Settings -> Integrations. 2. Find Azure Active Directory box in the list and click to open it. 4. Enter your Active Directory login credentials and Sign In. 5. 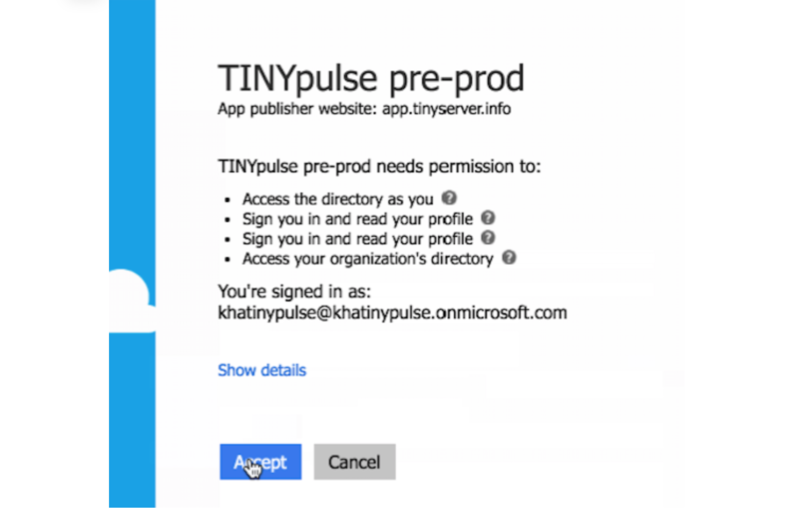 You'll be asked to grant permissions to TINYpulse to the Azure AD instance. Read the message and Accept to return back to TINYpulse. 6. Now that you're integrated, you still have to import the Azure AD groups to TINYpulse. Select the group(s) from the dropdown list that you'd like to sync and click Add when you're done. If you're new to TINYpulse and haven't invited any users yet, clicking Add will send invitation emails to new user immediately with their first Engage pulse survey. Once they get the email, employees can set their TINYpulse password and will have full access to respond to their Engage pulse survey, send Cheers, give anonymous suggestions, and more. If you've been pulsing for a while and are just looking to simplify user management going forward, existing TINYpulse users will be unaffected by the sync. They won't get any sort of notification from TINYpulse. However, if there are any TINYpulse users in your account that don't appear in Azure AD, they will be deactivated immediately. Azure AD serves as the one source of truth so please make sure that all of your TINYpulse users belong to one of the AD groups you've synced. When you select AD groups to sync to TINYpulse, they'll import instantly and groups will be auto synced once per day after that at midnight UTC. The default setting is to sync selected AD groups automatically. You can opt for manual updates by going to the Apps section and switching automatic updates off. When you switch to manual update mode, an Update button will appear so you can manually sync users between Azure AD and TINYpulse on demand. Turn off autoupdates for more control of your imports. However, we recommend keeping autoupdates on, especially if you have a dedicated Azure AD group for TINYpulse use. See below for more information about creating a new AD group. For further automation of TINYpulse user management, enable Segment and Filter syncs. This will automatically create new TINYpulse Segments and Filters based on your existing Azure Active Directory group structure. For example, let's say you've added these Azure AD groups to TINYpulse: Marketing Team, Sales Team, Engineering Team. This function automatically creates "Marketing Team, Sales Team, and Engineering Team" TINYpulse segments which allows you to easily view feedback in a filtered and targeted way without any upkeep within TINYpulse. Once you've turned on Segment and Filter Syncs, feel free to update the Segment names or change the mapping to another existing Segment. Will my existing users get overwritten if I import them from Active Directory? If the employee's email address from AD matches the one in TINYpulse then they will not be overwritten. They'll still keep their Cheers, survey streaks, segment and filters, the only difference is their name will update if there's a mismatch between AD and TINYpulse. AD is considered the source so the sync will update the name in TINYpulse to match. What happens if an existing TINYpulse user doesn't belong to any of the Azure AD groups I've synced to TINYpulse? Once you've completed your configuration, any users who don't belong to one of the synced Azure AD groups will be deactivated in TINYpulse. To avoid any disruption to your users and admin team, make sure that all TINYpulse users belong to an Azure AD group that is being synced to TINYpulse. Can I use Onboard for new hires with the Azure AD integration? At this time, all users synced from Azure AD will get Engage surveys by default; new hires will not get Onboard pulses. Please contact support@tinypulse.com or reach out to your customer success manager for assistance moving newly hired employees from Engage to Onboard. How do I deactivate a user when using Active Directory integration? You have to remove them from the AD group itself. We recommend having one specific AD group just for TINYpulse and you can add or remove users as needed (see below). If you deactivate the user in TINYpulse without removing them from the AD group, they'll just get reactivated during the next sync. What happens if I deactivate a user in TINYpulse but they still belong to the AD group? They'll get reactivated during the next sync. See above. What happens if a deactivated TINYpulse user gets synced from AD? The deactivated TINYpulse user will reactivate if they belong to an imported AD group. Remove the employee from the AD group in order to keep them deactivated in TINYpulse. What happens when a user gets removed from the AD group? They will be deactivated in TINYpulse and won't count against your per-seat subscription size. What information gets synced from AD? Employees' first name, last name, job title, start date, and email address will be brought over to TINYpulse. Manager isn't synced, so head on over to Users and Settings to add managers for each employee. We recommend creating one group in Azure Active Directory specifically for TINYpulse, especially if you have a large organization and not everyone needs access. Use this group to prevent syncing employees who actually don't need TINYpulse and will count against your per-seat subscription size. Instead of inviting and deactivating employees directly in TINYpulse, you can simply add or remove them from the AD group and they'll be synced for you. See the Azure AD documentation for Managing Groups for detailed instructions on how to create a new AD group for your TINYpulse application.